President Obama unveils his "partnership to rebuild America,"to revamp the nation's crumbling highways, bridges and other public projects. 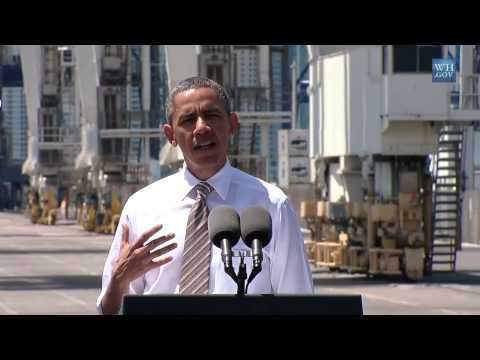 He made the speech at Port Miami, which is undergoing a two billion dollar upgrade. President Obama said "I've come to Port Miami today because there are few more important things we can do to create jobs right now and strengthen our economy over the long haul than rebuilding the infrastructure that powers our businesses and our economy -- our roads, our bridges, our schools, and our ports just like this one. "As President, my top priority is to make sure we are doing everything we can to reignite the true engine of our economic growth -- and that is a rising, thriving middle class. A growing economy that creates good, middle-class jobs -- that's got to be our true North. That's what has to guide our efforts every single day. And to do that, we should be asking ourselves three questions every single day: Number one, how do we make America a magnet for good jobs? Number two, how do we equip our workers with the skills they need to do the jobs? Number three, how do we make sure that hard work leads to a decent living? "When it comes to good jobs, no workers were hammered harder by the recession than construction workers. Fortunately, the unemployment rate for construction has been cut nearly in half over the past three years, partly because the housing market is starting to bounce back. But construction still has the highest unemployment rate of any industry. Breaking ground on more projects like this tunnel that I just saw means more good construction jobs that can't be outsourced. They have to be done right here in America. And they end up giving people good pay and good opportunities to raise their families. "Projects like this create a lot of other good jobs, too. You ask any CEO where we they rather locate their business and hire new workers. Are you going to set up shop in a country that's got raggedy roads, runways that are pot-holed, and backed-up supply chains? Or are you going to seek out high-speed rail, Internet, high-tech schools, new state-of-the-art power grids, new bridges, new tunnels, new ports that help you ship products made in America to the rest of the world as fast as possible? That's what people are looking for. That's what CEOs are looking for."